What's all this brick collecting lark? Here's where my niche lies. 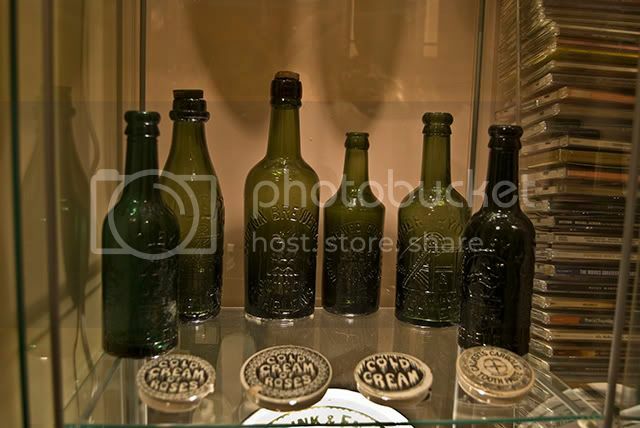 The earliest one pictured is an earthenware Ginger Beer from 1891. Everything is from St Helens or close by. I've got tons more stuff which either needs a damn good clean or just isn't 'shelf' material. 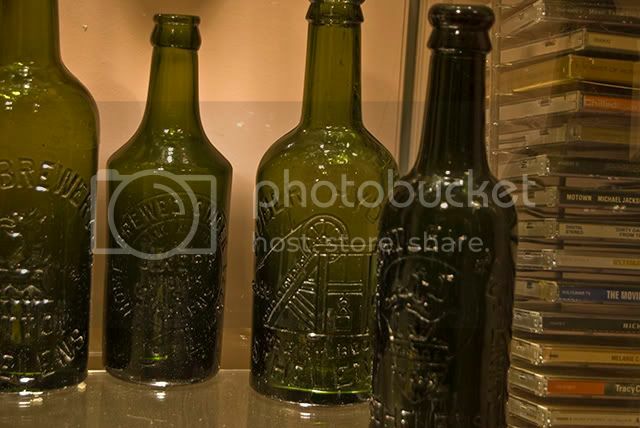 A Robert Ryder Beer bottle with headstock pictorial. Nice,that headstock bottle is ace.so have you dug these up? Yeah mate most of them have been dug or found at car boots etc. The headstock pictorial was chosen because Robert Ryder used to work down one of the pits in St Helens before going into the beer industry. 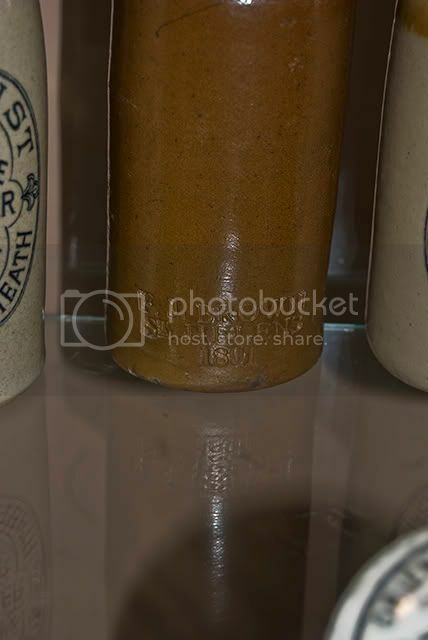 They also do a ginger beer bottle where the print is blue, fetches the best part of £400 for a decent nick one! Yes, the headstock bottle is tops. Want one! That's a very fine colllection you have there, and nicely displayed too. Brilliant collection there!! I don't clean mine up completely, quite like the little moss terrariums that they turn into underground. I do have a couple of sealed ones with a dubious liquid inside, but I think I will leave them shut. Nice to see some cleaned up and on display!! I've got a couple of Ryders bottles spare if you want one Tarboat. Thanks for the comments all, I don't like cleaning them till they're near new but as these are dug, I think the scratches and dings keep their 'old' feel. That's just a tease Walrus, is the farm still there? 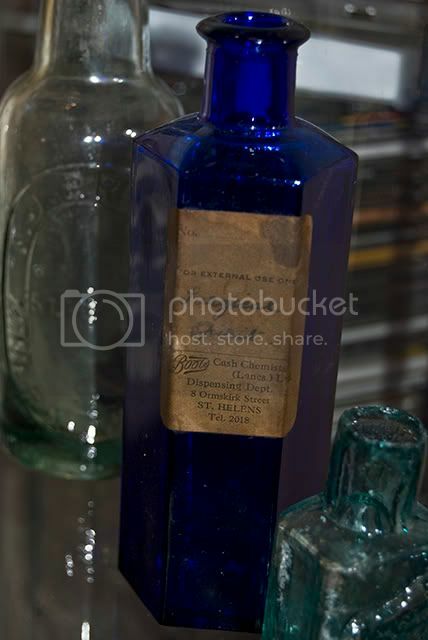 I come across a lot of these bottles and the old medicine bottles in the cellars of the chemist that i go to, all of them still have the stuff inside. 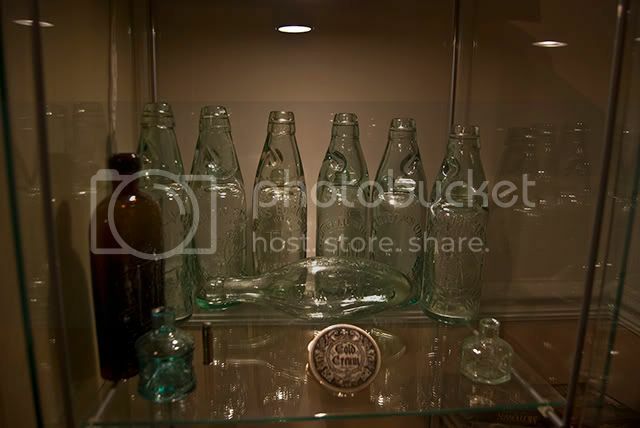 Sometimes there are quite literally hundreds of bottles dating back a very long time. I've even seen pharmaceutical cocaine, opium and heroin in small bottles and chloroform in quite large bottles (wouldn't want to drop any of that). Its interesting routing round through all the old boxes even the news papers that they are stored round them make very interesting reading. When ever the company comes across them though they destroy them straight away. 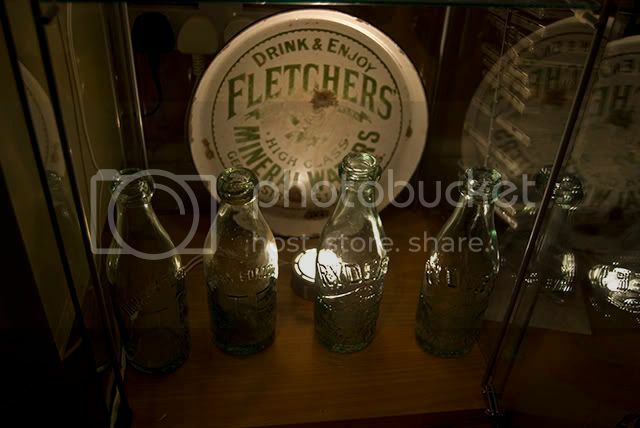 Ive tryd to blag them so many times if i could keep them even empty away the contents but they never let me take any. And id guess some of them must be worth a lot of money, all in pristine condition with labels. We've found bottles and other things that may be of interest around here 53.587296,-2.555598. It was a few years ago when we saw them but i assume they will still be here, It used to be an old tip. ...That's just a tease Walrus, is the farm still there? Cheers for that Buddah I'll check it out. Most old tips are developed on these days but you still get the odd later ones popping up (1920+). 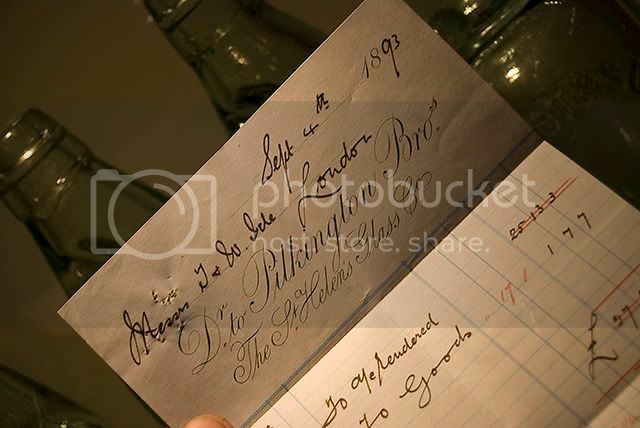 The best age to find is 1880 - 1893. 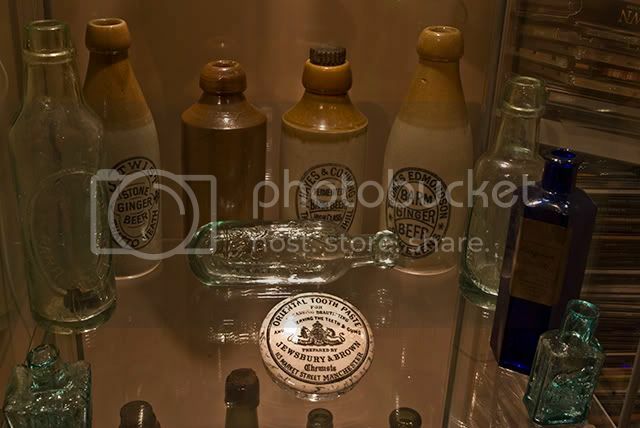 Medicine bottles are a giant kettle of fish. 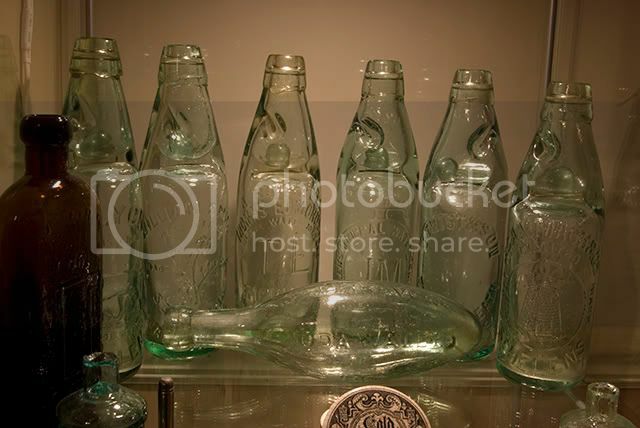 Whether they're worth anything depends on the size, shape and design of the bottle. It's a shame that they're destroyed as you never know what they may be worth unless you know what to look for.